Everything a good spy needs to know about secret codes, disguises, shadowing and observation skills. A brand new edition of a much-loved Usborne classic, sure to entertain and delight a brand new generation of spies. being urged to recruit middle aged mothers. 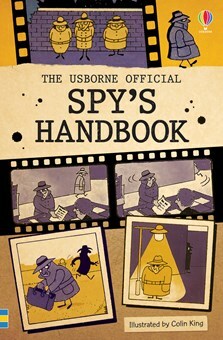 I love a book that encourages kids to be creative and The Usborne Official Spy’s Handbook is just that! From cracking secret codes and creating effective disguises to tracking and decoding signals it's a book to be kept close at hand but hidden from the unknown enemy. My childhood fixation with the art of spying — it hasn’t entirely gone away — was down to a book called The Usborne Spy’s Guidebook. "Le Carré for ten-year-olds, this book made espionage seem like a perfectly viable profession." Packed with tips and tricks needed to be a super spy, including quizzes to check how much budding Bonds have learnt. I remember reading this when I was a kid in the 80s with my sister and brother. We loved it, LOVED it so much! We learnt all the language codes, left secret messages for each other written in lemon juice (invisible ink), and played dress-up with all the suggested disguises. Our copy of the book was passed down from our older cousins, so it was falling apart by the time we were done with it. I'm overjoyed it's still in print! I am definitely buying a new copy for myself, and many more more for my nieces and friends' children too. I read this and the Detective books from Usborne when I was a child and loved it. I loved the pictures drawn by Colin King and how the themes were organized. It's a must-have for any kid and I'll lend mine to my daughter when she comes of age. We bought this book for our 6 year old daughter. She loves reading it with her dad, its great for them to have something special to do together. I pretend to sneak up while they are reading it, to try to spy on what they are doing - she loves it. My husband and I also remember this book from when we were children. We both loved it. My wife bought me a copy of the Spy's Guidebook for Christmas, every page is amazing! This was one of my favourite books from childhood, and I have fond memories of every illustration. Hopefully my kids will spend as many days, weeks and months playing undercover agents as I did! You'll soon find yourself checking out hollow logs for secret messages and viewing anyone in a raincoat, hat and dark glasses with even more suspicion than usual. Send coded messages to friends with the Usborne Ultra-Decoder!